The team of researchers, led by UM biological sciences Professor Anna Sala, published their findings in the journal Proceedings of the National Academy of Sciences this month. 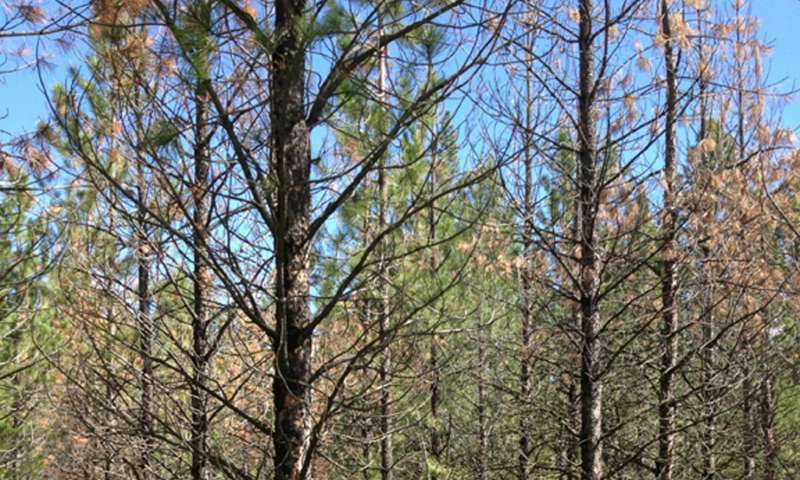 The study, based on a 38-year ponderosa pine genetic experiment at UM's Lubrecht Experimental Forest, found young families of fast-growing ponderosa pines typically survived to maturity better than slow-growing ones—but this was not the case when mature trees were affected by a mountain pine beetle outbreak. In that scenario, slow-growing families survived better. "Our findings explain why natural tree populations maintain a mixture of genotypes with different growth rates," Sala said. "The study illustrates why the maintenance of genetic diversity is critical to cope with the varying demands as organisms grow, as environmental conditions change and with the variety of risks that organisms face during their lifespan—particularly under climate change, when the frequency of drought, insect pests such as the mountain pine beetle and extreme events are predicted to increase."